All American Futurity winner and leading second crop sire No Secrets Here will stand at Royal Vista Ranches near Wayne, Oklahoma. WAYNE, OK�JULY 7, 2013�All American Futurity winner and a leading second crop sire No Secrets Here will stand the 2014 breeding season at Royal Vista Ranches, LLC near Wayne, Oklahoma after returning from the Southern Hemisphere breeding season in Sao Paulo Brazil where he is currently standing at Benny Rosset's Haras Flor Do Campo. The son of all-time leading sire First Down Dash is now owned by the No Secrets Here Partnership, consisting of Benny Rosset, Mauro & Marcos Zaborowsky � Haras Vista Verde in Sao Paulo, and Royal Vista Ranches, LLC � Vaughn & Jill Cook in Wayne, OK. The 2006 All American Futurity winner still holds the record for the fastest 440 yard All American Futurity in history :20.88 seconds. No Secrets Here won or placed in 17 of 19 career starts earning $1,637,095. He also won the Z Wayne Griffin Director's Stks-2nd Div. and was second in the Los Alamitos Super Derby(G1), Los Alamitos Winter Championship(G1), Go Man Go H.(G1), and Z Wayne Griffin Director's Stks-1st Div. He was third in the Los Alamitos Two Million Futurity(G1), and Ed Burke Million Futurity(G1) and was a multiple finalist to the Champion of Champions(G1). In the breeding shed, No Secrets Here has sired 94 winners and nine stakes horses from two crops to race. 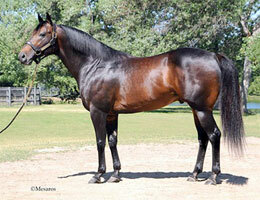 His foals have earned in excess of $1.38 million with average earnings per starter of $14,618. They include All American Futurity(G1) third place finisher Aha Moment SI 97 (3 wins to 3, 2013 $315,862), South Florida Derby winner Habits Secret SI 102 (4 wins to 3, $184,855), G2 placed Henoshersecet (4 wins to 3, $139,193), Oklahoma Futurity(G2) winner Fetching Beauty SI 93 (Winner at 2, 2013 $132,000), stakes winner High School Secrets (5 wins to 3, $81,016), Old South Futurity winner Secrets Fly SI 96 (3 wins at 2, $55,375), etc. No Secrets Here is out of the Grade 1 winner Dicey Secret SI 95 ($203,666) winner of the Governor's Cup Derby(RG1), PCQHRA Derby(G3) and California Sire's Cup Derby(RG3). She is the dam of 9 ROM, three other stakes horses including Thaddeus Green SI 98 ($34,247), We Have A Secret SI 97 ($23,360) and Secret Separation SI 96 ($18,928), dam of AQHA Racing Champion 3-Year-Old colt Hez Our Secret SI 95 ($827,051 to 4, 2013) and stakes winner Secretly Famous ($23,307). The second dam is the stakes-placed and multiple stakes producer daughter of Band Of Azure, Band Of Dice, dam of stakes winner Dicey Dee SI 107 ($153,387), stakes-placed Press Bet Si 95 ($21,981), etc. For additional information or breeding contracts call Laura Wipf, Royal Vista Ranches Farm Manager, at 405-449-7575.